PRODUCT: Adjustable Solar Panel universal mounting bracket option. Allows mounting remote solar panel. Fits 10-25W panels used on Attic Breeze models and others. Price/Bracket. DESCRIPTION: Allows mounting remote solar panel either on a pole, the side of a wall, or on your roof. Once mounted, the solar panel can be adjusted to any angle or direction desired. When mounting to flat surfaces bolts or lag screws should be used (not included). 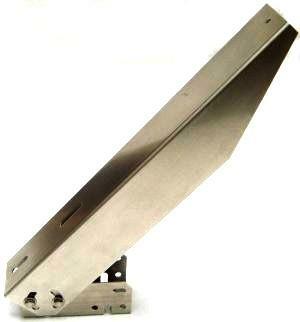 The mounting bracket accepts a horizontal (roof), vertical (wall) or pole mounting. The panel bracket bolts to the panel using 5/16” hardware for BP modules and 1/4” hardware for all other modules. The panel should be placed tight against the tapered end of the panel bracket. Some modules will not span the entire bracket length. The panel bracket bolts to the mounting bracket using 5/16” hardware. Pole mounting can be accomplished using U-bolts with retaining clamps or with hose clamps (not included).